→ Article: 343's plans for the future of the franchise; Next major entry's reveal "won't be soon." 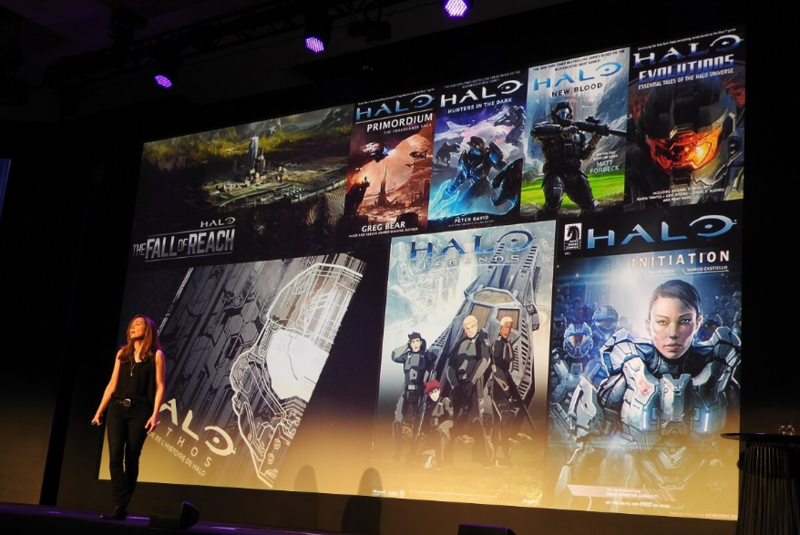 Bonnie Ross stated at the D.I.C.E Summit earlier this year that Halo 6 will involve a more "simpler story" that focuses on the Master Chief and no new playable characters. She also stated that future titles will include the splitscreen option due to the backlash of Halo 5's lack of having splitscreen functionality. It was explained that taking it out in Halo 5 was a tough choice due to Halo 5's 'mass scale environments, improved AI behavior and increased visuals and gameplay fidelity.' Regarding the story, she said "while we love our transmedia, sometimes I do think we tell a little too much story in our games." This statement by itself stirred some confusion in the community. Some saw it as bad thing because they feel that the future entries could end up lacking the amount of lore and detail that Halo 4 and Halo 5 Guardians contained. Other saw it as a good thing becasue they feel it would be a lot easier and lighter on the casual players to understand the story. Bonnie Ross later cleared up the statement on Twitter that she also enjoyed the direction Halo 4 went storywise. Halo fans who are looking forward to the sequel to Halo 5 will have to sit back and get comfortable because 343industries stated that the next major title's announcement won't be anytime soon. That means out at Germany's Gamescom or the upcoming PAX 2017 conventions. Back in May, 343's community manager Brian Jarrard (aka Ske7ch) had warned fans that 343 will have no major announcements at E3 2017 for Halo. "I'll slip into my dreamcrusher persona for a minute in the name of realistic expectations. We've said this already but we'll have a little something at E3 but it's not related to the next major entry in the franchise." This 'little something' was revealed to be a paid expansion for Halo Wars 2 which brings the Flood back into the fray on the Ark post-HW2 titled "Awakening the Nightmare". In last week's Halo Community Update, Jeff Easterling (GrimBrotherOne) acknowledged the already predicted disappointment of the community from what E3 did and didn't show. "While there's little to nothing to be said on that front, it's been made clear that we won't be talking about Halo's next major title for quite sometime. And no, that doesn't mean Gamescom. Or PAX. Trust us, when we're ready to pull pack that proverbial curtain, you'll know. It won't be soon." Some members of the community took to the internet to voice their displeasure at this news, but also a good amount took to various forums such as Reddit's r/Halo and Waypoint to explain how this could mean 343 is willing to take their time to make the next entry better than the last, and fix their mistakes to ensure they deliver a game that the community wants. Many speculate that the next entry's reveal may take place at E3 2018 with a release later in 2019, but we won't know until 343 is satisfied and ready for an unveiling. →Article: 343's plans for the future of the franchise; Next major entry's reveal "won't be soon."